Milk is a mainstay in many diets around the world. It comes in a variety of forms: raw, pasteurized and powdered. Numerous milk-based products are also available, including cheese, yogurt and ice cream, as well as numerous other packaged goods, which are derived from some form of milk. Each milk form carries advantages and disadvantages. Early human beings, primarily hunter-gatherers, did not use milk products. However, dating back as far as 9,000 years, nomadic and agricultural societies depended on the milk of cattle, sheep, goats, horses, water buffalo and camels. These cultures valued milk for its nutritious properties. In the early 20th century, in industrialized societies, concern arose over the development of milk-borne diseases. This led to the acceptance of pasteurization, a process of heating milk at very high temperatures with the intention of destroying the microorganisms that cause infection and lead to milk spoilage. Powdered milk originated in the 1800s as a method of preserving milk. The powder is made by removing all moisture from milk. Pasteurization was developed by Louis Pasteur in 1864. Pasteurization destroys microoganisms that can appear in milk and cause illnesses, such as tuberculosis, typhoid fever, scarlet fever, sore throat, diptheria and gastrointestinal ailments. It's also meant to counter organisms that lead to the souring of milk. The process involves heating the milk to temperatures between 150 to 300 degrees Fahrenheit and then cooling it. Pasteurization kills dangerous germs, but it also destroys beneficial bacteria and other nutritious constituents. Because pasteurization destroys bacteria that cause souring, pasteurized milk has a longer shelf-life than raw milk. Powdered milk's shelf life is even longer than liquid milk and it does not require refrigeration. However, powdered milk does not last forever, as its fats eventually turn rancid. 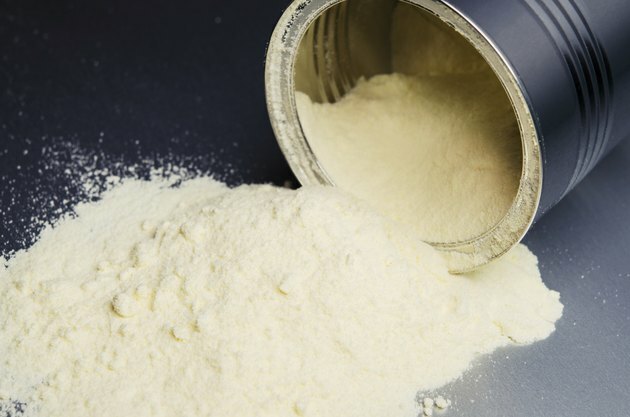 While powdered milk lasts longer in storage, it does require the extra step of adding water before use, and once water is added to powdered milk, the shelf-life is the same as for liquid milk. Pasteurized and powdered milk have lower levels of nutrients compared with raw milk. Pasteurization destroys all microbes in milk, including lactic acid bacilli, which are beneficial to health, enhancing the gastrointestinal and immune systems. Additionally, according to Sally Fallon, a nutritional researcher and author of "Nourishing Traditions," pasteurization alters milk's amino acids; promotes rancidity of fatty acids; destroys vitamins A, D, C and B12; and reduces the minerals calcium, chloride, magnesium, phosphorus, sodium and sulphur, as well as many trace minerals. Furthermore, the heating in pasteurization destroys the enzymes in milk, which otherwise help the body assimilate nutrients, especially calcium. Often, some synthetic vitamins are added back to pasteurized milk, however, without milk's natural enzymes, they are difficult to digest. Powdered milk has the same nutrient deficiencies if its source is pasteurized. Additionally, powdered milk contains damaged cholesterol, which promotes injury to blood vessels. In terms of monetary output, powdered milk costs less than liquid milk. Powdered milk also lasts longer. Powdered milk generally tastes worse than liquid milk, however, when used in baking, the difference is not noticeable. Pasteurized milk tends to taste inferior to raw milk. The Weston A. Price Foundation: What Is Real Milk? Should I Boil Raw Milk?